Teach Laugh Plan: Calling All 3rd, 4th, & 5th Grade Teacher Bloggers! Calling All 3rd, 4th, & 5th Grade Teacher Bloggers! 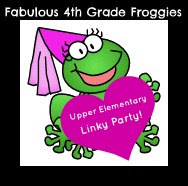 I know I am missing so many upper elementary blogs out there since I don't have a lot of time to surf the web so I decided to have an "Upper Elementary Linky Party"! This way I can follow all of you, if I am not already (and perhaps you can follow me too). I also want to provide my followers with other upper elementary blogs to read. I love sharing ideas, strategies, and tips that we can all use in our classrooms. I love my lower elementary and secondary friends too but this time its just for 3rd, 4th, and 5th Grades. Just link up below! Please make sure you snag the pic above and add it to your blog or blog post and link it back to this post. What a Great idea! I can't wait to find some new fabulous blogs! I've already found you, I'm a new follower! Thank you for organizing some upper elementary blogs! I teach third grade and although I follow a lot of blogs, it is so time consuming to hone in on some just for upper elementary. I hope to learn how to do a blog during the summer! Teaching Blog Traffic School I've learned soooooooooooo much from it (and I'm still learning). I just added my blog and posted your Linky Party to it. What a great idea! Thanks for putting this together. WooHoo! You did everything just great! Hi Molly! Thanks for stopping by! I look forward to collaborating and networking with you! Oh Thank you for doing this! I was getting jealous of all the K-2 linky fun and now we can have our own! I am so excited about finding new teachers! Your ROCK! What a fabulous idea! I am so glad I found your adorable blog. I am a new follower, and I just had to link up. Thank you! Thank you so much for doing this! It was such a SMART idea :) I just linked up and can't wait to check out everyone. Thank you Elizabeth! I love learning about all these new blogs! Yay... So exciited to have more blogs to follow!! Good idea with the Linky Party! I've been looking for more "intermediate" blogs! :) I'm one of your newbie followers! Thanks Josh! I am so glad you linked up! I love your blog! I got your email. Sorry about that. I am working on my computer at school and I had already linked up. When I tried to post from school on my blog, it wouldn't let me because it said my browzer was not supported. I didn't want you to think I wasn't following the rules. I will just have to do this at home after conferences tonight. =) Have a great evening! No problem at all! I just wanted to send a reminder. My computer at work won't let me do a lot of things in the blogging world either :) Guess they want me teaching and not blog stalking. LOL! Thank you for hosting! We're always outnumbered by primary teachers, so I love connecting with other intermediate bloggers as well. Thanks Christi! I am excited to see their are so many intermediate bloggers out there! Great idea! I am a 5th & 6th grade teacher and I am always looking for ideas for my classroom. Thank you for doing this. Thanks! I will probably spend the whole weekend blog stalking all the participants. I can't wait! This is great! I am always looking for more 3rd-4th-5th grade blogs! LOL Monica! I am so excited to stalk all these blogs! Hope you find a lot of new friends here! Sure thing! Thanks for linking up! This is fantastic, thanks so much :) I am excited to read all of these great blogs and get super inspired this weekend. I'm loving your blog, too! I am your newest follower. Awww thanks Stephanie! I'm following you now too! Thanks for organizing this! I'm excited to go blog hopping this weekend! I'm your newest member! Yes! More blogs to check out. LOL! That's exactly what I am thinking Emmy! I'm following you too! Thanks for linking up! Check them out. Happy Blogging. This is wonderful! Thank you so much for organizing this!!! I love your blog by the way and am excited to be a new follower! I'm having fun too Miss Alissa! I'm excited to be following you now! Hi. I'm your newest follower! Thank you for having this blog party. I am a new blogger and I am always eager to discover new and inspiring blogs. When you get a chance come over and visit my blog. Thanks Ms. Morton! LOVE LOVE LOVE your blog design....so cute! Thank Katie! I hope you find lots of blogs to stalk!!!! I know I have. I commented on your facebook, but just wanted to say again, loved your linky party and love your products and ideas!!! Thanks Laura! I entered your giveaway. Thanks for linking up! Thanks for this linky party, Lorraine! It has been great fun finding all of these other blogs. Thanks for organizing. You are so welcome Jennifer! This is so fun learning about all these new (to me) blogs! YAY! You fixed me! Thank you so much! I'm so glad I could help Mandy! I am your newest follower and love your blog! Thank you for posting this! I found out about you from Farley at Oh Boy Fourth Grade. This is my first Linky Party, so I hope I did this correctly! Thanks for linking up! I'm your newest follower! I'm so excited about this. I don't have a blog with follow by email. I'm so happy you did this. Thank you Micha! I am so glad you follow by email. Keep checking back for new additions to the growing list. Thank you for hosting this! I have spent time this afternoon getting to know new colleagues. You are very welcome Mary! I am loving all these new (to me) blogs! Thank you! I am in Japan and teach 4th grade. Looking forward to exploring all these great blogs. Hi again, love the blogs listed here! I wasn't able to link up. Any suggestions? I am so sorry I didn't see this until now. My link up was down for a bit try again and if it doesn't work email me at rainee2011@gmail.com and I will figure out what is wrong. It worked - thank you so much! Wow...isn't it just amazing how many of us are out there! Though I don't blog (though I would like to start now is not the time!) I am thoroughly impressed! Thanks to each and everyone of you who share and hopefully I can return the favor at some point. As Sister Sledge so fittingly states it "We are Family!" Thank you SO much for hosting this party!! With this great idea, I just had to start following your blog. Can't wait for more genius ideas from ya!! :) I have been trying for awhile now to get followers and when I woke up this morning I had 10 new ones! It was like CHristmas morning for me!! haha. so Thank You!! You are so welcome! I follow you too! Thanks so much for doing this. I am eager to find new blogs for my grade level! I've not had much time to post, but I look forward to getting ideas from other 4th grade teachers!! Hi Taira! Thanks for linking up! It won't recognize it. I am not tech savvy....Please help. Such a great idea, as it's hard to find intermediate blogs. Thank you! I'm also having trouble adding my link. I posted thew picture and linked to your blog, but it's still saying I'm not backlinked. :( Suggestions? Thanks! Glad you figured it out! Hi Lorraine! Finally have my cpu up and running after the short. Like I said in my email; your linky party was a "shocking" good time! :D Love your ideas! Hi Hilary! I am so sorry I missed this! Yes, you can link up. Oh, and do you care if I copy your idea about the grade level linky? I'd like to have one for 2nd and 3rd grade blogs. Thanks! Still can't link up. I have a back link to this page and it still wont let me submit my blog. Can anyone help please? Finally! Who knew a .ca vs.com could cause such issues! It won't let me link up! It says that I have no backlinks to your site but, lol...I have 3! My blog post is at http://theboxofcrayons.blogspot.com/2012/05/fabulous-4th-grade-froggies-linky-party.html. Hi there...I am very new to blogging and I'm trying to link my site to yours (which looks awesome!) I am having a devil of a time. What am I doing wrong? I have added your button to my site...but when I try to add my link it says we aren't linked.... Help! :) I am very anxious to be a part of this! I love your blog, and copied your button! I just tried to join your linky party, but it says I need a backlink? I am new to blogging, so I don't know how to fix that. Hello All! I'm a first year teacher and my latest hobby is checking out the awesome blogs and Pinterest! I will be teaching third grade in September and I'm excited and nervous about having my own classroom. Thanks for thinking of such an awesome idea! I want you to know I keep coming back to this page to find other upper elementary teachers. Today I stopped by and realized I had never followed your blog. I fixed that today. I hope you are enjoying your fourth graders as much as I am enjoying mine this year. My name is Leslie Mejia and I'm an 8th grader at the San Francisco 49ers Academy. The 8th grade girls are currently working on the Technovation contest. The Technovation contest is basically a contest for young girls to create an app to help the community. My group is working on an app for 3rd-5th graders. We want to help them practice/study/learn more. I was wondering if you guys could do us a huge favor and take our 3rd-5th grade teachers only survey. We'd really appreciate it and thanks for your time!